That first couple of days back to the grind after a long weekend can certainly be, well, grinding. This is sort of where I’m at right now- feeling like there are gears rubbing together to their detriment rather than as an effective means of propulsion. It’s likely not helping that we got MORE FREAKIN SNOW yesterday, but today the sun is shining and the temperature has crawled above the freezing mark, so I’m trying to let that inspire me to get some work finished up. February is my least favourite month- for any number of reasons, but most of all because- despite the fact that it has the least number of days- it seems to be the lo-o-o-o-o-o-ngest by far. And it’s generally cold. And slushy. And overcast. I know. Complaining about the weather is a particularly futile exercise, and I’m really trying hard to get off the complaining-to-no-purpose train. If I have a complaint it should be about something tangible, and about which I should be able to do something. 2014 is the year of change and action, after all. I saw two movies at the theatre this weekend and finished a couple of books- so I admit to having had more than my fair share of leisure time mixed in with the usual running around and seeing to responsibilities and proactive measures to affect the change I’d like to see, both in my own life and in the world as a whole. As it turned out, both films very much jibed with the way my thoughts have been cycling lately. Creativity and art and expression and music and magic and wonder… we NEED more of these things. And yet, those who undertake these most important human constructions and creations (and those who pursue studies about these most important human constructions and creations) are told- over and over and over again- that there is NO PRACTICAL VALUE in doing so. The first movie was just for fun- but turned out to be more than that. The Lego Movie featured a pretty cool message- about the need for creativity and the desire to work outside of pre-ordained and restrictive societal norms. That cookie-cutter buildings, ‘reality’ television shows about the banality of life and prescribed over-priced coffee may resonate with the lowest common denominator, there remain those among us who strive to create things of beauty and value- and that those things can be at least as practical as those that are mundane and conformist. I loved it. It was fun and it was clever and it hit all the right notes. I can’t get that freakin Everything is Awesome song out of my head, but this is incidental. On Monday we opted for something a little more serious but, interestingly, along the same lines. The Monuments Men tells a mere slice of the story of the quest to recover art and artifacts stolen by the Nazis over the course of World War II. I’ve seen a lot of not-so-great reviews of the film and, honestly, not one of them remotely deterred me from checking it out. For one thing, how do you not love that cast? And the idea behind it (the movie and the real life events that the movie is based on)? That crushing the Nazi onslaught and ridding the world of the repulsive ideology that drove the power and land grab- evidence of some of the worst of humanity- would have been an incomplete victory if they had been able to destroy the art that is an expression of the best of humanity? That. Exactly that. How AWESOME and inspiring and affirming is that?!?! Some have called it ‘preachy’ (ineffectually preachy, actually). Others suggest that no work of art is worth a human life. Those who lost their lives (or risked imprisonment as collaborators) in the pursuit of the preservation of some of the greatest art known to humanity begged to differ. They understood that destroying that which defines us as human- those creations of beauty and insight and appreciation of our world and history and stories- leaves us bereft of a vital element of our shared experiences. The movie also served to pique my curiosity about the subject and the events and the history of this group of scholars and artists, who, like me, see incredible value in the great works we leave behind us. The Monuments Men website offers all kinds of resources for education about the men and women of the MFAA (Monuments, Fine Arts and Archives) who succeeded in saving so many of Europe’s great cultural and artistic achievements. I am, primarily, an historian. I learned about World War II- mainly about Canada’s involvement and through my studies about the Holocaust (from a Religious Studies perspective, for the most part), but the story of the preservation of our art and culture- and the ideology and spirit behind those who successfully emphasized the NEED for the preservation of the art and culture? This is a new and wonderful lens into an important battle that was fought and won through sacrifice and determination. In a society that is increasingly determined to insist that everything is disposable commodity, the actions of these men and women- scholars of art and architecture and literature and history- as presented for the popular media in the form of a Hollywood movie (a sincere thank you, Mr. Clooney) is incredibly timely and important. With every ongoing conflict and new outbreak of violence in the world we are in danger of incrementally losing our shared humanity. Not just through the egregious and shameful disruption and taking of innocent lives, but through the destruction of our shared history and its important remnants- be they literary, artistic, historical or architectural. 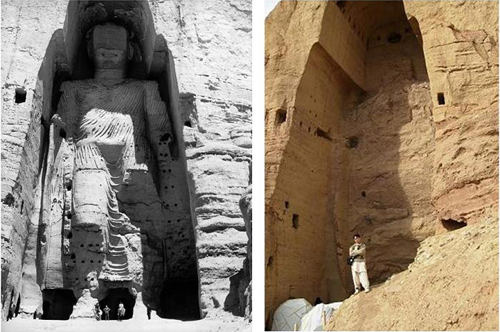 I cried when the Buddhas of Bamiyan were destroyed by the Taliban in 2001. Syria’s ancient treasures- along with its people- are being systematically destroyed, just as happened in Iraq over the course of that ‘conflict’, in the name of political and religious ideologies that are all about power, influence and economics. Please note that the ideologies driving these wars and atrocities are being enacted IN ALL CASES for the benefit of the few without consideration given to the lives and heritage of the many. I loved the movie. I’ve bought the book. Some reminders for those who persist in refusing to see the necessity of the Humanities. While I admit that our opinions sometimes differ, Alan Cross has had an undeniable impact on radio and music appreciation in my part of the globe. And his mind works similarly to mine. His Ongoing History of New Music and The Secret History of Rock link together music/musicians and the context and history in which they were writing. During his tenure at CFNY the station was cutting edge in its programming and support of the music industry in Toronto. Gotta give the guy his props. I saw something about this particular situation last week and, while my original impulse was one of outrage, I set it aside to explore more thoroughly when I had a bit more time. Alan has done a very good job of gathering the deets on his blog and explaining some of the whys and wherefores behind this ridiculous decision. As he notes, while the Harper government has certainly not been shown to be a great friend of the development and preservation of programs meant to enhance the arts and culture, this ridiculous new fee that is to be levied on foreign musicians who wish to perform in Canada is actually collateral damage from a scandal that came to light last spring. RBC- the largest financial institution in Canada- was taken to task (rightfully) for laying off Canadian workers and replacing them with foreign contract workers. This resulted in the expected amount of backlash in the media, from Canadian labour groups and from the opposition parties in the House of Commons. The Harper government’s response was that they were ‘working on’ the problems with the Temporary Foreign Workers Program. Result? This new $275 application for offshore workers who wish to apply for jobs in Canada. And that Canadian workers MUST be offered the positions first. All fine, on the face of it. But, as Alan notes, whoever wrote this addendum to the Program rules did not think about the specific needs/realities of the music industry. Alan is a music industry insider, and, as such, can (and does) speak far more clearly about the ramifications of this fee for bands (from other countries) who are signed to Canadian labels and other such intricacies. I am pissed about what it will do to the diversity and availability of bands that come through this town o’ mine on a regular basis. One of the things I love most about this city is the number of smaller venues that offer exposure to both local and touring bands that are not regularly found on the radio stations that are run by the huge, corporate and impersonal media conglomerates. I love perusing the tickets lists on the sites run by independent record stores like Soundscapes or Rotate This. For a few bucks you can see new music- or old favourites- at all kinds of cool joints around town. Some of these bands are just starting out- and working hard to garner followings and gain some exposure. I have been lucky enough to see a whole lot of hard working musicians in these small clubs, bars and taverns over my lifetime- sometimes little bands who later went on to command stadium crowds (and ticket prices). But more often I tend to gravitate to those singer-songwriters who have made working careers of writing and playing their own music in dive bars and concert halls- touring for the love of the music and the interaction with the appreciative ears in their audiences. These are not necessarily musicians who are likely to make it to the stadium level or regular airplay on local radio station morning drive times. But the rapport with the audience and the pure energy that is generated with a smaller crowd in a smaller venue is something that should be experienced- and it is that which is threatened by this reactionary and unexamined application of a rule meant to crack down on the bad publicity that arose with the RBC situation. The Legendary Horseshoe Tavern is one of my favourite music venues in town (seriously, check out the ‘History’ section on their website. There’s some pretty cool stories in there). In addition to the annual Skydiggers Christmas show (which is a holiday tradition with some of my peeps), I have seen an number of great bands there over the years. It was during TIFF. The Boss was in town in support of “The Promise: The Making of Darkness on the Edge of Town”, so there was a whole lot of speculation about whether or not he might put in an appearance at Jesse’s show at the Horseshoe. Tickets, that I had bought at Soundscapes for $14, started selling for crazy prices on Craig’s List and Kijiji. My friend, who first introduced me to Jesse, is also the biggest Springsteen fan I’ve ever known, so there was a fairly high level of hope and anticipation (though he was convinced that it wasn’t to be) in the air as we showed up for the gig. The Horseshoe was PACKED. Like I’ve never seen it before. And it was filled mainly with film industry douches who were there only on the off-chance that Bruce would stop by for a set. When Jesse and the band took the stage, I set aside my frustration that a large percentage of the audience was there only to be seen and/or in case of a Bruce appearance (they continued to talk on phones- and occasionally to each other- as the band began their set. Honestly. The rudeness. Put the damn phones away and give the BAND your attention and respect) and let the music flow. Jesse and the band were electric- and full of personality that would have been lost in a less-intimate setting. At one point Jesse climbed across the heads of the crowd to the bar to grab a tequila shot from the incomparable Teddy Fury. All things considered, the band handled the gig with grace and respect- for those true fans who were there to see THEM (Bruce never did show- to the surprise of almost no one who was actually there to see Jesse and the St. Mark’s Social). I’ve since seen him twice- both times back at the ‘Shoe- and both times with a more modestly-sized audience (one was a January show and it was so freakin cold outside that I could hardly blame people for not coming out). Though there might have been fewer of us, the enthusiasm (of the audience and the band) was engaged and completely together. At one point Jesse had us all sitting in a circle on the dance floor singing along to his great cover of the Replacements’ Bastards of Young. It was like a camp out. In the Horseshoe. With Jesse Malin. Those are the kinds of shows- and the type of venues for live music- that are threatened by the arbitrarily applied rule that has been put in effect by Harper’s Conservatives. As Alan Cross points out, Canada is NOT closed for business and exposure to great, working musicians from all over the world. While some people may be content with spending hundreds of dollars to see mainstream acts (I hesitate to call them all ‘artists’) at massive venues, I remain part of the music buying (and appreciating) public that likes to see new music in smaller places without having to take out a bank loan (likely negotiated by someone from overseas who was hired before the rule went into effect). There are certainly bigger concerns in the world at the moment. The issue of intervention or non-intervention in Syria tops the discussions that are happening in the rooms of power around the world. I understand that. It’s making both my heart and my brain hurt. But this issue, close to my very soul since it is a big part of the soul of the town (and country) I love, is another example of programs/rules/procedures being instituted by a bureaucracy/government without analysis or insight into larger or longer-term consequences. It’s Monday, and the week is likely to see some pretty big decisions that will have ramifications for us all. I’ve already started my reading list with this and will continue on from there as I try to get a handle on the push for military intervention in Syria. But I plan to ease back into the week. But. As I keep emphasizing, it is our responsibility to stay awake and aware of what our politicians are up to- and speak up when it isn’t acceptable in our reasoned assessment of the situation. Whether the proposed actions are an attempt to halt thousands of people killing other people in the name of ideology and power, or a ridiculous surcharge for musicians who enrich the already rich life we are privileged to have here in Canada. Proportion matters, but so does participation. It might just be me, but I’m finding the interworld a pretty inexplicable place lately. Everywhere I seem to look there is another story/opinion piece/condemnation/defence/piece of fluff about a spoilt popster and her behaviour on an award show hosted by a channel that I once revered but that ceased to be about actual music a veryvery long time ago. I have no opinion on the whole thing. Is she a talentless hack as is maintained in most of the posts I’ve seen? Couldn’t tell you, since I don’t think I’ve heard one of her songs all the way through. Ever. I tend to be pretty quick to judge what I find listenable, and if it ain’t I change it up. As far as my experience of her is concerned, she looks like Vanessa Bayer on SNL and speaks like a clueless teenager with too much time and attention afforded to keeping her in the spotlight. Is she a young woman embracing her sexuality in defiance of her squeaky clean Disneychildstar image? Couldn’t care less. Not my type. Should the guy she was grinding on be getting some of the flack about this whole event? Probably- if it’s being handed out, it should be proportional to involvement. Is he a misogynist jackass? Couldn’t say- although in his case I HAVE heard the song (only because it was on Colbert and I love Colbert- the whole Daft Punk thing was awesome. Didn’t see it? You should) and I gotta say that ‘overrated pap’ is an understatement. I don’t have children, so I really have no legitimate input about the impact and influence of ‘tween heroes on the littler humans among us. Except to say that you’re the parent- therefore it’s your call on what what the littles are exposed to. Or not exposed to. Something like the MTV Awards is probably not appropriate viewing for the younger set (this is based upon my last viewing of the show which, if I remember correctly, involved an aging popster sharing kisses with two younger cookie-cutter-replica popsters). Yes, there has been a lot of extraneous press about the whole thing that is creeping out of prime time and likely past the parental filters here and there- I get that. It’s kind of the point of this post, actually. So this morning, while getting myself ready to force myself out the door to get to the oh-so-frustrating day job, the CBC was talking about Syria, and the division in opinion as to next steps and ‘points of no return’– at the UN, in the US, UK and here at home. Seems Harper, as usual, is ready to act unilaterally rather than forestall his planned prorogation of Parliament. You know, doing the opposite of what is supposed to happen in our political system. (Haven’t we been here before? All of us, I mean. Not just those of us here in Canada with our Head Oligarch making all the tough calls. All of us in the West who are being goaded into an untenable situation that will require the use of force and have lasting repercussions for all countries- and their citizenry- involved). And then it was back to the Miley-crap. The media- and the interworld especially- won’t shut up about half-naked shenanigans among the talentless over-privileged celebrities that are ever-present and prioritized by those in charge of setting the programming/editorials/filler that makes up our daily go-to sources of information. While actual important and potentially world-altering news is restricted to argumentative and ill-informed pundits and brief editorial soundbites. I’ve mentioned this, and my belief that it is a conscious technique being employed by our governments- with the complicity of the media moguls- to keep the population anesthetized to the mess that is the world (and the country, and the province, and the city), before. I am increasingly finding myself at complete and total wits’ end lately. Whatever wits to which I may have been able to legitimately lay claim seem to have fled completely. This is, admittedly, partly due to my own current less-than-stellar Sitz im Leben, but the overwhelming desire to just turn it all off and disconnect completely from the wider world that seems immune to voices of education, intelligence, moderation and reason is, well, overwhelming right now. Anomie, thy name is Cole. Then a ray (or, literally, Ray) of sunshine popped up on one of those problematic social media outlets I was just railing about. I have one more cottage weekend coming my way in a couple of weeks, and I have now found THE book that will accompany me and help me from getting caught up in too much debauchery and craziness. Ray will keep me company while the annual Bay Cup tournament is going on. (‘The Bay Cup tournament?’ you ask. It’s a full contact, no holds barred, friendship testing game of Risk- in which I cannot participate due to a long ago incident of Risk-related violence that has led to post-traumatic Risk disorder (PTRD)). I love the Kinks. I can remember hunting for limited edition vinyl copies of my fave albums at the Vinyl Museum on Yonge Street back in the day, and scoring a pristine edition of Lola Versus Powerman and the Moneygoround Part 1 (there is no Part 2, incidentally). THAT was a good day. Ray Davies is a storyteller par excellence. The characters and themes that run through his songs remain familiar- like old friends. Who doesn’t know the name of the cheeky lass who had a ‘dark brown voice‘ and ‘walked like a woman and talked like a man‘? ‘Father Christmas’ gets a whole lot of air time in my house ’round the holidays. It’s a social commentary and snappy tune all in one. Today, being reminded that he, and other actual songwriters like him. are out there in the world was a breath of fresh air in the midst of my existential despair. I’ll get back to you (and to my hero worship of Ray) once I’ve read the new book. But lest we forget why we NEED dudes like him, and his brother, Dave (shouldn’t play favourites, there’s enough sibling rivalry in that relationship already) writing songs and telling our stories and sounding alarms, the last word(s) can be Dave Davies’. Time to shift the dialogue back to things of actual import. But there’s no England now. Somehow don’t seem to matter very much anymore. But inside we’re the same as we ever were. It’s a crime, but does it matter? Break their hearts and break some heads. Always lost in blood and guts. And when they’re gone, it’s me and you. This past weekend started off with tonnes o’ summer fun and ended with some heavy reflection. There was a whole lot going on in the City and on the world stage that took me down some well-travelled paths of both hope and despair. The 2013 Pride celebrations wrapped up successfully, with all indicators pointing to a good time having been had by all- including the Premier of the Province of Ontario, who participated in most of the events (‘our’ mayor having absented himself once again)- and the excitement is already building for next year’s World Pride Celebration. A great finish to a week that saw some pretty cool stuff happening- basic human rights-wise– in the US. Canada Day Spectaculars were held across the country- including in Calgary- where their mayor (a man definitely worth the title) asked his residents to take a day off from the flood clean up and enjoy themselves after all their trials and hard work over the past couple of weeks. Amazing to see the way that neighbours are helping each other out and moving forward in the face some pretty hefty devastation. Cmdr. Chris Hadfield sang on Parliament Hill- solidifying his presence as a science celebrity and positive influence for curiosity, education and the arts (not so separate from the sciences it turns out) and bringing smiles to the faces of everyone watching- whether on the Hill or from home (and Metric rocked hard. As usual). From genuinely thinking that hey, this world is a pretty great place, back to feeling overwhelmed by power- and hatred-driven craziness. There was that anomie again, and I was feeling as if attempting to affect change is very much a ‘one step forward, two steps back kind of undertaking.’ Not an ideal way to start the work week. Add to that the fact that Nelson Mandela has been on my mind- and in the collective thoughts of most of us- I started thinking back to that peculiar period back in the 80’s, when apartheid was still an institutional evil and shameful blemish on the face of the world. (Is that Bono or a leprechaun at 4:28? And who dances like Peter Wolf? Ah, memories). Way back in 1985 I was pretty much oblivious to larger world affairs, including the mounting opposition to the racial segregation that was the institutionalized reality for generations in South Africa. I was deeply into my books and the music that provided an interesting soundtrack to that period of my life. I knew that some countries- and the UN- were imposing economic sanctions against the government and growing louder in the condemnation of the system of state-sanctioned racism. I proudly learned a little piece of Canadian history that noted that Prime Minister Diefenbaker, in 1961, was responsible for breaking the deadlock of Commonwealth leaders regarding whether or not South Africa would remain part of the Commonwealth. His suggestion that the application not be denied outright, but that racial equality as an important principle of the Commonwealth be emphasized, resulted in South Africa withdrawing its application- a key Canadian contribution to international politics on an important human rights issue. One would think that the opinions of the West had grown even more opposed to the system of apartheid– the Afrikaans term for ‘a state of being apart’ (there it is again- that irrational fear of the ‘other’)- as the decades of oppression stretched on and the situation grew increasingly violent. Peaceful protest- by students and labour unions- ended with gunfire and death at the hands of the military powers of the government. Many strong voices against the government were killed or imprisoned in attempts to silence the opposition and maintain the status quo- even amid increasing international pressures. The Roman Catholic Church- and its leader Pope John Paul II- stood in solidarity with the chorus against apartheid. Anglican Bishop Desmond Tutu supported the economic boycott of his homeland- despite the hardships it would cause the poorest of the poor. On the other side, the Dutch Reformed Church in South Africa remained committed to the system of apartheid- impeding political reform from within the country. International sports associations like FIFA banned South Africa from participation in sporting events. 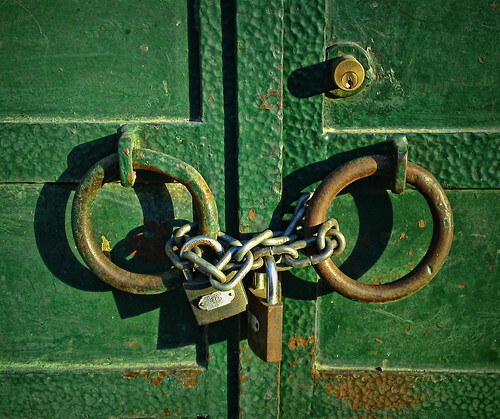 Academic and cultural institutions were encouraged to terminate links with the country as long as racial discrimination continued. in 1985, (Little) Stevie Van Zandt became involved with the anti-apartheid movement, initially upon hearing that the system was influenced by the American model of Indian reservations. Since the issues of North America’s First Peoples was a primary focus of Stevie’s interest, the parallels between them and black South Africans struck a particular chord. While traveling to research his next album, he became particularly upset by the ‘resort’ area, Sun City, a gambling mecca in a bantustan (Bophuthatswana)- a created ‘homeland’- in an impoverished rural area. He gathered ‘rockers and rappers’ who joined together to speak against the injustice of apartheid and the American government’s official position on South Africa. As Joey (miss that guy) notes at 2:22- “Constructive engagement (was) Ronald Reagan’s plan.” Unlike the UN and most of the rest of the Western World, the US government promoted this mandate as an alternative to economic sanctions against South Africa. (Although Maggie Thatcher echoed the policy during her tenure as British PM). This political stance meant that only about half of US radio stations played “Sun City”. But in countries without such resistance to positive and necessary change, the song became a major success- raising awareness and seeking freedom for the entire population of South Africa. As that awareness continued to grow, the Reagan administration maintained its stance against the ANC and resistance t0 the imposition of trade embargoes and economic sanctions. But the voices against what Bishop Tutu called “an abomination, an unmitigated disaster” (in a 1984 speech on Capitol Hill) began to increase, even in the conservative US of the 1980’s. The Republican party turned against its President on this issue, and Congress overrode Reagan’s veto of the Comprehensive Anti-Apartheid Act of 1986, ending constructive engagement and instituting the imposition of economic sanctions that caused South Africa’s economy to drop to among the lowest in the world. Between 1990 and 1996 apartheid was systematically abolished. In April 1994 20,000,000 South Africans cast their votes in the first free elections, and in May of that year Nelson Mandela was sworn in as South Africa’s President. At times when we seem to be increasingly divided by our differences, it is extremely valuable to remember that we have worked together to affect positive change and to realize the revocation of significant ideological evils- changes that work for our common good and prosperity. Regardless of particular story variations or political maneuvering for the sake of greed we CAN work together toward what we know is right. Even when it seems as though our political leaders are all about economic bottom lines and support of the status quo as a means of maintaining power. Songs like “Sun City” tap into the popular culture to raise awareness and inform those uninterested in bored jaded by the political posturing that detracts from the real issues of rights and freedoms, as the pundits and talking heads spout policies based in ideologies (and stories) that should be left to history. Once that awareness grows we can collectively tell our elected leaders just exactly where we ain’t gonna play. History shows us that if enough of us shout it out they do have to listen. I realized this morning that I didn’t define my terms very well. Bad Historian. ‘Constructive engagement’ sounds nice on the face of it- after all, ‘constructive criticism’ is meant to improve the thing being criticised, right? And being ‘engaged’- in all senses of the word- is also something positive. Reagan advocated using incentives rather than sanctions to encourage South Africa to move away from its institutionalized policy of human rights violations. The reason? Political expediency. In the Cold War of the 1980’s, the Reagan Administration feared the growth of communism in Africa, and viewed the white minority government of South Africa as an ally in its prevention. Ignoring a nation’s human rights record in order to further a particular agenda? Doesn’t sound at all like the Harper government’s relationship with China and their increasing involvement in oil and gas development and their investment in the oilsands at all. The parallels can be extended to include the West’s intervention- or lack thereof (depending on self-interest) in the various actions taking place in the Middle East, and right here at home to our Idle No More movement.